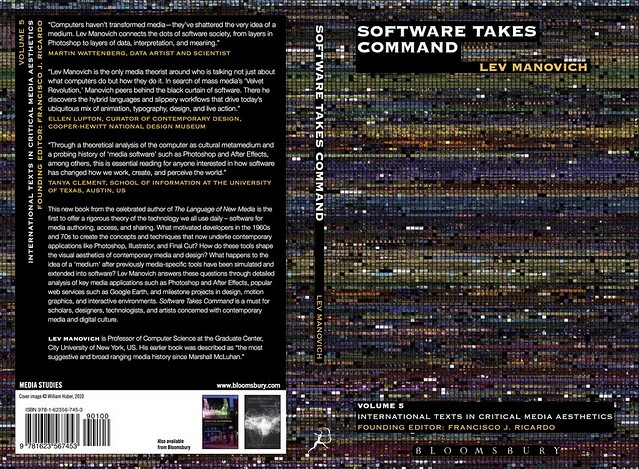 The front and back cover of Lev Manovich's Software Takes Command (Bloomsbury Academic, 2012). The background image is taken from visualization of video gameplay created in our lab by William Huber. The data are the game play sessions of the video games Kingdom Hearts (2002, Square Co., Ltd.) The was played from the beginning to the end in 29 sessions over 20 days. All together, these sessions took place 62.5 hours. The video captured from all game sessions were assembled into a singe sequence. 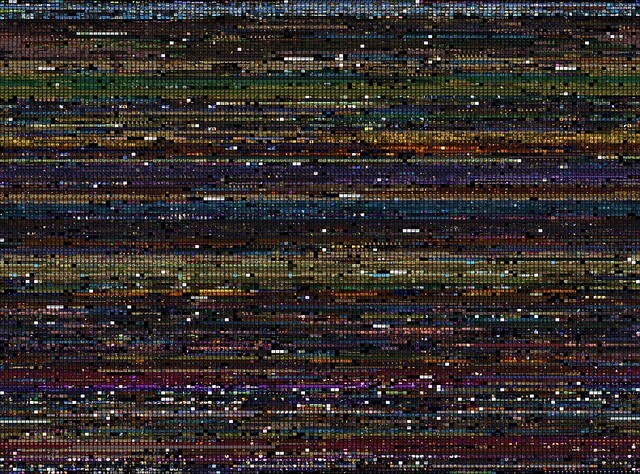 The sequences were sampled at 6 frames per second. This resulted in 225,000 frames for Kingdom Hearts gameplay. 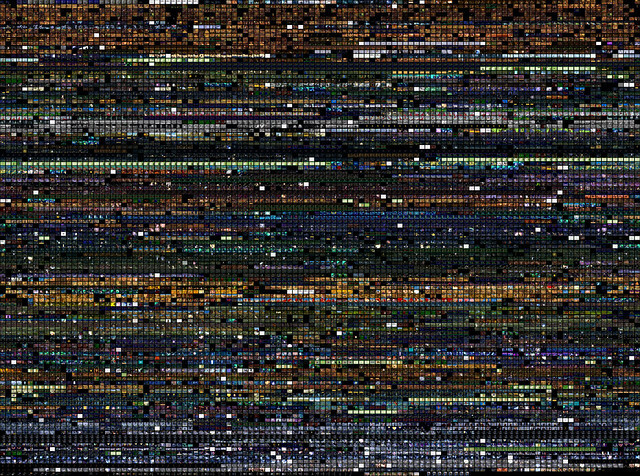 The visualizations use only every 10th frame from the complete frame sets (22,500 frames). Frames are organized in a grid in order of game play (left to right, top to bottom). Kingdom Hearts is a franchise of video games and other media properties created in 2002 via a collaboration between Tokyo-based videogame publisher Square (now Square-Enix) and The Walt Disney Company, in which original characters created by Square travel through worlds representing Disney-owned media properties (e.g., Tarzan, Alice in Wonderland, The Nightmare before Christmas, etc.). Each world has its distinct characters derived from the respective Disney-produced films. It also features a distinct color palettes and rendering styles, which are related to visual styles of the corresponding Disney film. Like other software-based artifacts, video games can have infinite varied realizations (since each game traversal is unique). Compressing many hours of game play into a single image and placing a number of such visualizations next to each other allows us to see the patterns of similarity and differences between these realizations. Such visualizations are also useful in comparing different releases of the popular games – such as the two releases of Kingdom Hearts shown in the two visualizations below. The complete visualization of Kingdom Hearts (2002) game play: 62.5 hours, in 29 sessions over 20 days. Full size visualization is 10810 x 8000 pixels (download from Flickr). Visualization of Kingdom Hearts II (2005) game play: 37 hours, in 16 sessions over 18 days. Full size visualization is 10759 x 8000 pixels (download from Flickr).